Want to learn more about Monty’s Liquid Carbon and humics? Monty’s Liquid Carbon is a registered trademark of Monty’s Plant Food Company. Apply at varying rates depending on purpose or desired result. For general soil conditioning, apply 2 quarts per acre directly to soil in fall and early spring. May also be applied at the same rate at pre-plant, planting, or for Residue Management. Apply 1 quart per acre when foliar applying with liquid nitrogen or other fertility products. For crop specific application information, see crop section of the catalog. The thing I have seen with Monty’s products that I like a lot is reducing wheat burn. We do a lot of top dressing in wheat in North Carolina with liquid products like 30% UAN. Often times when it’s heating up, that wheat is growing rapidly and is very susceptible to leaf burn. 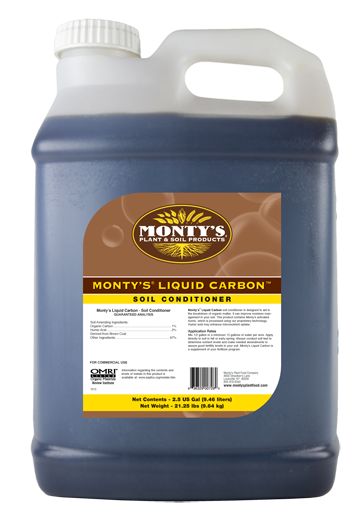 I like to put in a quart of Monty’s Liquid Carbon to an acre and it improves that plant’s growth and resists that leaf burn that we so often see with UAN.